The extreme inclination of Iris' poles to the Ecliptic means that areas of the asteroid's surface remain in constant sunlight for months at a time, while other regions lie in shadow. One of the most prominent asteroids of the Asteroid Belt, Iris is among the brightest of these bodies; indeed, it is on average the fourth brightest (after Vesta, Ceres and Pallas) and at times can approach the magnitude of the largest asteroid Ceres. Iris was the seventh asteroid to be discovered, just one month after Hebe in 1847, and is named for the Greek goddess of rainbows. Iris' orbit carries it around the inner part of the Asteroid Belt, and at its perihelion it can come close to the orbit of the planet Mars. 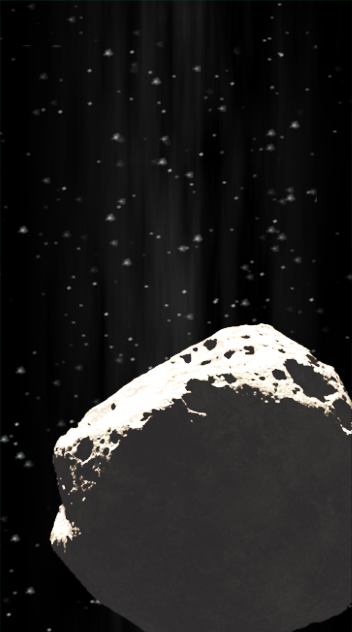 Iris is one of the larger asteroids of the main Belt, with a mean diameter of a little over two hundred kilometres. This places at among the largest asteroids of its kind, probably fifth in rank among the stony type, though uncertainties over the exact diameters involved make this an approximate ranking. Over asteroids of all kinds, it is roughly twenty-second in order, at about one fifth the diameter of Ceres. Physically Iris appears to be very approximately spherical in shape, but with angular faces that give it something of a polyhedral appearance. The brightness of its surface varies across the body, with one hemisphere apparently showing a rather higher albedo (or reflectivity) than the other.